Eli Terry's genius at the beginning of the 19th century was one of the contributing factors enabling America to grow into the industrial giant it is today. Terry built a factory in Plymouth Connecticut, installing a waterwheel to power many different machines. In 1807 he received a contract to make 4000 wooden tallcase movements. The first year was spent making all the jigs and templates. The next two years was spent in making the 4000 movements, a task that was completed on time. The importance of this is that he mass produced parts that were completely interchangeable with very little fitting, an unheard of feat at the time. He then went on to design and build his pillar and scroll clock. 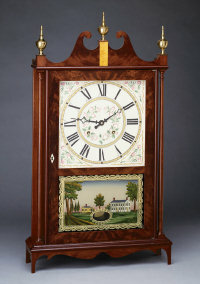 This clock sold for $15.00, a price that was affordable to the general public, meaning that timekeeping was no longer dependent on the sun or village clock. The pillar and scroll clock became very popular, and soon it was copied by many other clockmakers. The area around Plymouth Conn. had abundant supplies of wood, steams to harness for the waterpower, and many talented people. By 1850 it was the clock making center of the world. When Robert set about to make this clock, he borrowed from an antique dealer friend three original clocks. From those he made up the plans for the clocks. Other than a few concessions to practicality, such as an eight day brass movement versus a thirty hour wood works movement, the cases are true to the originals. The woods, finish, and joinery is the same. For the movement they use a eight-day German movement, time and strike. The dial is wood, hand painted by a local artist, the lower glass tablet is a reverse painting using original scenes, and the upper glass is made using methods of the early nineteenth century.